Family was a drama about a middle class family living in Southern California with a working Dad, stay at home Mom and three kids. Dad, Doug Lawrence (James Broderick) is an attorney in a single practice and Mom, Kate Lawrence (Sada Thompson) is a homemaker and family problem solver who later in the series returns to college to pursue a music career. The kids were Nancy (Meredith Baxter Birney) the oldest, Willie (Gary Frank) was the middle child and Letitia, nicknamed “Buddy” (Kristy McNichol) was the youngest. Plots in the series revolved around pretty typical family dynamics with quite a few dealing with topical subjects. 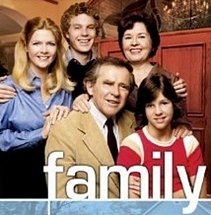 Nancy gets married in the first season only to divorce in the second, they had a son, Timmy (Michael Schackelford) who also became part of the family. Later in the series the Lawrence’s adopt a girl named Annie Cooper (Quinn Cummings). The break-out star of the show was Kristy McNichol. She won 2 Emmy’s for her role in Family and she went on to act in feature films including “The End”, “Little Darlings”, “The Night the Lights Went Out in Georgia” and others. She also had a role as Barbara Weston in the NBC sitcom “Empty Nest” (1988 – 1995). A writer by the name of Jeri Emmet sued Aaron Spelling claiming that the concept of “Family” was based on a script that he had submitted to Spelling. Countering that, Spelling said that he and Leonard Goldberg had come up with the idea for “Family” one night over coffee in his kitchen. Counting appeals and counter suits the litigation lasted for 25 years with the only clear winner being, of course, the attorneys.